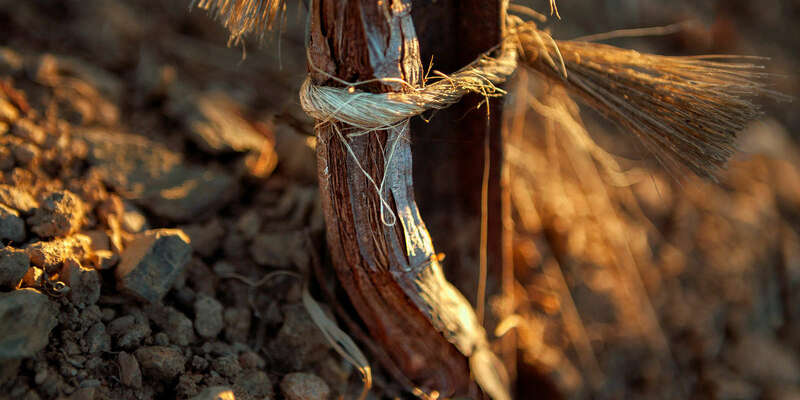 Aeris (air or climate in Latin) reflects our belief that the great terroir driven varieties of Italy can be successfully grown in California but it’s critical to find the appropriate microclimate. Piemonte has cool days but accumulates much heat due to the low diurnal (difference between day and night temps) and warm nights. Of course the soil is of ultimate importance and like our Rhys vineyards, we have looked for the rare combination of perfect climate and interesting rocky soils. This search has lead us to plant a remote ridgetop in the rugged mountains of Northern Sonoma County. Here we found the warm nights and cool days necessary to grow truly great Nebbiolo (the king of Italian wine). Like Pinot Noir Nebbiolo is extremely gifted at reflecting the site in which it is grown and we expect it to deliver a very interesting complex and long-lived wine from our rocky soiled vineyard. In addition to Nebbiolo, we have also begun the process of importing 3 varieties unique to the Etna volcano in Sicily. We believe that Carricante, along with Chardonnay and Riesling, is one of the world’s truly great white wine varieties. The Carricante wines from the town of Milo, perched on the east slope of the volcano, have long been known to be exceptionally complex and age worthy which has garnered the area a special designation – Etna Bianco Superiore (Italy’s version of Etna Grand Cru). In addition we are bringing in the two great red grapes of Etna – Nerello Mascalese and Nerello Capuccio. Together these grapes produce a red wine of elegance and great terroir transparency. While few Americans have heard of Carricante, we firmly believe it is one the world’s greatest white wine grapes. At its best, Carricante produces ageworthy white wines that exhibit intoxicating aromatics and complex rich fruit buttressed by outstanding acidity and intense minerality. Carricante is often difficult to judge when young as the complex aromatics require some time in the bottle in order to fully develop. Also, in order to experience Carricante’s unique charms, it is important that it not be blended with other white grapes. For this reason, there are only a handful of accurate Carricante bottlings in the world today. Until our introduction of the grape to California, Carricante has been grown exclusively on the upper reaches of the massive Etna Volcano on the island of Sicily. It reaches its zenith on the eastern slope of the volcano, near the town of Milo, at elevations exceeding 2400 feet. Generations of Sicilians realized the exceptional quality of Carricante from this region and granted it a special designation of “Etna Bianco Superiore” which is analogous Burgundy’s “Grand Cru” designation. While it is often found inter-planted with less capable white grapes such as Cataratto and Minella, Italian law requires a minimum of 80% Carricante in order to be designated “Etna Bianco Superiore”. Aeris’ estate Carricante vineyards can be found in Sicily’s prime Caselle district as well as our Centennial Mountain vineyard in California. Both sites are planted with 100% Carricante in order to fully express this grape’s amazing potential. Nebbiolo is widely recognized as one of the world’s greatest red wine grapes. At its best, Nebbiolo is utterly intoxicating with an ethereal palate, mind boggling complexity and tremendous thrust. For these reasons, we are extremely passionate about the wines of Barolo, Barbaresco and the Alto Piemonte but there are many puzzling, unanswered questions surrounding this extraordinary grape. While most of the world’s greatest grape varieties such as Pinot Noir, Chardonnay and Cabernet Sauvignon have found very successful homes in the New World, Nebbiolo has not achieved the same level of success outside of its ancestral vineyards. While some may speculate that this is due to a requirement for a specific soil type only found in a region such as Barolo, this is clearly not the case as within Italy Nebbiolo has made acclaimed wines from many very different soils for decades or even centuries. So if Nebbiolo can succeed on diverse soils, what could it possibly need that the New World can’t provide? The answer is — Nebbiolo has very specific climatic requirements that do exist outside of Italy but they are quite rare. The most important of these requirements is a hard to find combination of cool days and warm nights. The vast majority of the vineyard locations in the New World have conditions that are the exact opposite, warm days and cold nights. With this insight and a great deal of climatic data, we began to search California for an area that could mimic the climate of Nebbiolo’s greatest regions. Our search lead us to a remote, high altitude ridgetop close enough to the ocean but sheltered from its coolest influences. While the altitude helps moderate any daily high temperatures, the top of California’s coastal mountain range also experiences comfortably warm nights in the summer. The result was nearly a perfect match to Nebbiolo’s most acclaimed locations. Our fascination with Nerello Mascalese developed hand-in-hand with our fascination with Carricante. After tasting some of the stunning wines made from Nerello vineyards on the north side of Mt. Etna, we were surprised that the wider wine world wasn’t more familiar with the grape! The best examples remind us of everything that we love about great Pinot Noir and Nebbiolo- bright red fruit, complex aromatics and a savory, earthy finish. Much like with Carricante, we felt that Nerello Mascalese was a perfect fit for the growing conditions, altitude and unique geology of our Centennial Mountain Vineyard.